Open sided with wrought iron fencing, adjoining picnic pavilions that can be rented separately or as one. Each side seats approximately 125 people. Both sides have a kitchen with a gas stove (no oven), sinks, electricity and a serving counter. The south side has a walk-in cooler (no freezer) and the north side has a commercial size refrigerator with a freezer. Each side has a large barbeque grill located behind the kitchen area. There is also a separate restroom building at the site. Please Note: Groups with an estimated attendance of more than 150 people will be required to reserve the entire pavilion. Alcohol: The possession and consumption of non-intoxicating malt liquor (containing not more than 3.2% alcohol by weight) is permitted from 8:00 a.m. to 8:00 p.m. within the designated picnic areas. Glass beverage containers are not allowed. Seats approximately 50 people. The shelter has electricity and a large double grill. A restroom, play area and drinking fountain are nearby. Note: The maximum size group that picnic permits will be issued to for this shelter is 99 people. No tents are allowed in the West Picnic Grounds. The Streetcar Station is a heated and air-conditioned facility available for year-round rental. The building is not available for rentals on Sundays from 10:30 a.m. until 5:30 p.m. as it is open to the public every Sunday as a Streetcar Museum from 12:00 p.m. (noon) to 4:00 p.m during permit season, and the first Sunday of the Month from November through April. The building is equipped with tables and chairs. The setup of tables and chairs is the responsibility of the permit holder. Take down of the tables and chairs will be done by Parks staff after rental is completed. Reservations for the Como Streetcar Station ONLY: City of Saint Paul residents and businesses may apply for a permit the first business day of the month, 13 months in advance of their desired event date. Non-residents and businesses may apply beginning the first business day of the month, 12 months in advance of their desired event date. Alcohol: The possession or consumption of alcohol is prohibited at this facility. The space has a maximum setup capacity for 50 people using tables and chairs. This does not include space for display/serving tables. Auditorium style-seated events (with chairs only) have a maximum setup capacity of 75 people. This does not include space for display/serving tables. For information on rentals for private events or meetings, visit the Como Lakeside Pavilion website. Located within the Como Zoo grounds at 1225 Estabrook Drive. Como Zoo is home to over 125 species of animals. Host your next picnic at Como Zoo Picnic Pavilion and your guests will enjoy a deliciously catered meal in Como's private picnic shelter. 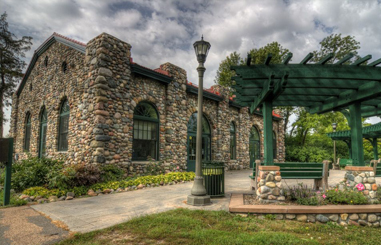 The Como Zoo Picnic Pavilion offers a beautiful private setting and a covered pavilion for group events. The Como Zoo Picnic Plaza is available for rental every day from May through October. The Plaza is rented two times per day from 10:30 am – 1:30 pm and from 2:30 pm – 5:30 pm. Contact Lancer Catering at 651-487-8282 for more information. Visit the Como Woodland Outdoor Classroom website for permitting information or contact the Permit Office at parkspermits@ci.stpaul.mn.us or (651) 266-6400. Visit the Como Park Zoo & Conservatory website for more information. To rent one of the four ball fields located north of Horton Ave at Como Regional Park, contact Northwest Como Recreation Center at (651)298-5813. To rent facilities at McMurray Athletic Fields, contact the Municipal Athletics office at 651-558-2255, email ​fieldrentals@ci.stpaul.mn.us or visit the facility rentals website for more information.